Chag sameach! Please join us at our annual Community Potluck Passover Seder on Saturday, as well as at Shabbat services and any of our other activities this week. Friday, ​April 14, 7:30 p.m.
We will begin to set up for the seder following services—consider staying a bit later to help set up. 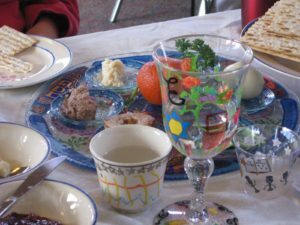 Volunteers requested for Passover Potluck Seder set up! A few more volunteers to help set up for the seder dishes, silverware, seder plates, glasses all need to be set up. There will be a crew there starting around 11 for a few hours, or come before the seder. ​Thursday, April 13, 7:00 p.m.
All members are welcome to attend​. Have you fulfilled your pledge for 2016 – ’17? Our fiscal year ends April 30th. Come to the meeting and hear what’s been planned for next year and a recap of this year.